Looking at today's George Mason University, one of Virginia's larger higher educational institutions with over 35,000 students, faculty, and staff, it is difficult to believe that it began in a humble eight-room elmentary school with 17 students in September 1957. Mason has come a long way in a short fifty years - from a tiny branch college of the University of Virginia to a major university. Though George Mason's history as a traditional institution of higher learning begins in 1957, its owes much of its early history to its ancestor, the Northern Virginia University Center, which is still in existence today. The creation of the NVUC and the subsequent movement to create a branch college of the University of Virginia in Northern Virginia helped put together a cast of characters, such as C. Harrison Mann, Jr.; J.N.G. Finley; Clarence Steele, and Lorin Thompson, just to name a few, who played important parts in later stages of Mason history. Below is a brief narrative of George Mason University's history, accompanied by supporting documents. Please follow desired links to view each document in detail. In early 1949 Colgate W. Darden Jr., President of the University of Virginia, contacted C. Harrison Mann, Jr.; an Arlington lawyer and UVA alumus and asked him to organize an exploratory committee of local citizens to find support for higher education in Northern Virginia. At the committee's first meeting Clarence Steele, another Arlington resident, who was employed by the Bureau of Public Roads, was elected chairman of this committee. In March of 1949 Steele met with George B. Zehmer and Professor John Norville Gibson Finley of the University of Virginia's Extension Division and a group of interested citizens to issue a formal request to Darden for the creation of an extension office in Arlington to serve the needs of the northern Virginia community. The new Northern Virginia University Center (NVUC) was established in rooms at Washington-Lee High School in Arlington, VA with Finley as its first director in September 1949. Later that year Steele was elected Chairman of the newly created Advisory Council to NVUC/UVa. He was charged with the task of creating enthusiasm for the project, advising the new center, and securing funding for the continuation of the project. Over the next few years the new center grew along with the surrounding community. During the 1951-1952 academic year the total number of classes offered grew to 89 with an enrollment of 1,192 students. With the continually rising enrollment it soon became clear that a larger higher education institution was needed to service the increasingly growing population of the Northern Virginia region. In 1954 discussions began between Zehmer and Darden on the possibility of developing a two-year branch college in Northern Virginia to provide higher education for traditional college-age students in the area. Darden immediately began to seek legislative approval for the plan and also convinced the Board of Visitors that a permanent advisory body was needed in northern Virginia to work with Finley in the planning and developmental stages of the proposed branch college. Later that year, the Virginia Advisory Legislative Committee, which was composed of members of both houses of the Virginia General Assembly, conducted a study on higher educational opportunities in the Commonwealth and published the report: The Crisis in Higher Education in Virginia and a Solution. The report recommended the establishment of two-year branches of the larger institutions in Virginia in areas of the state where no such facilities existed, giving college-aged men and women an option to stay in state for at least the first two-years of their education. A contibutor to the report, Dr. Lorin A. Thompson from the University of Virginia, later became Chancellor of George Mason College in 1966 and the first president of George Mason University in 1972. C. Harrison Mann, Jr. and George Zehmer participated in the VALC's report as subcommittee members. A recording of a 1956 speech by Mann illustrates his support for the Committee's measure. As per the recommendations of the VALC report, the Virginia General Assembly passed Resolution Number 5 establishing a two-year branch of the University of Virginia in northern Virginia in 1956. Once established, the University College of the University of Virginia, as it was originally named, began a search for a permanent location. Progress was slow as many offers and donations of land and space from all over the northern Virginia area were made. Planning for the long term future was a priority in choosing a location that would allow for growth while helping the development of the region in general. With classes slated to begin in the fall of 1957 President Darden announced the temporary leasing of an old elementary school building at Bailey's Crossroads which would house the new University College until a permanent location could be chosen and suitable facilities constructed. In early August of 1957 the Bailey's Crossroads location was occupied, and classes began on September 23 with an initial enrollment of 17. It served as the home of the college for the next seven years as the search for a permanent site was continued. In 1959, after much discussion, a new permanent location was chosen for the new 2 year extension school. Located just south of the town of Fairfax the donation of land was formally presented to the Rector and Board of Visitors of UVa by John C. Wood, Mayor of the Town of Fairfax. The deed was recorded on February 10, 1959 in the Town of Fairfax Virginia. In November 1959, the Board of Visitors voted on a new permanent name for University College: George Mason College of the University of Virginia (GMC) was chosen. Though often overlooked, as the humorous letter from Finley to the New York Times subscription manager below illustrates, Mason was one of colonial and revolutionary Virginia's leading citizens and the author of the Virginia Declaration of Rights and the Constitution of Virginia. His home, Gunston Hall, is located nearby in Fairfax County. By the summer of 1960 the firm of Saunders and Pearson Architects of Alexandria, Virginia rendered the first master plan for the Fairfax Campus. In August of 1963, after six years of branch status and classes at Bailey's Crossroads, GMC broke ground at the site of the new Fairfax Campus. Construction began four days later on the first four buildings which will be named; North, South, East and West. In October 1963 the Gunston Ledger, the first student newspaper, began publication. In December John Finley decided to retire after guiding the new institution from its inception in 1949. Robert H. Reid, formerly Dean of Kendall College in Illinois was named as Finley's successor as Director of George Mason College. By August 1964 the new Fairfax campus was nearly complete and students and faculty actually assisted the movers in the transfer of material and equipment from Bailey's Crossroads to the new facilities. In September, the campus opened to an enrollment of 356 students, and on November 12, Virginia Governor Albertis S. Harrison gave the keynote address at its dedication. In 1966, only two years after the opening of the new Fairfax facilities the Virginia General Assembly authorized George Mason College to become a four-year degree-granting college giving it a long-range mandate to continue to expand into a regional university of major importance, including the granting of graduate degrees. The first four BA degree programs were: Biology, Business and Public Administration, English, and History. Over the next year the student population increased to 1,128 with a faculty of eighty- three. With former UVa professor, Lorin A. Thompson as its new Chancellor, George Mason College was growing and becoming its own institution. It would not be long before it would become independent. 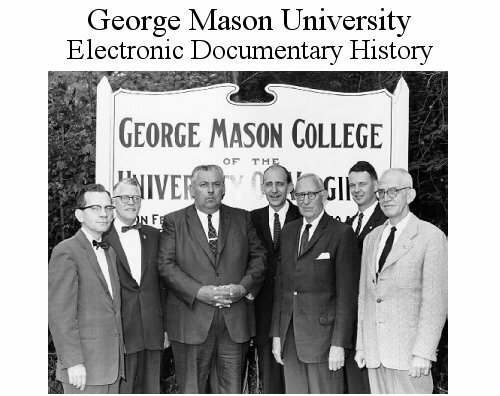 George Mason College granted its first bachelors degrees in 1968 to a graduating class of 52 students. This was a major milestone as it had only recently moved into its new facilities 4 years before. During this same year two major planning documents were authored. One, an academic plan, included specific recommendations for growth through the 1976-77 academic year and general recommendations through 1985. The other, a new campus master plan, offered an early look at the future shape of Fairfax Campus. In 1969 Governor Mills E. Godwin, Jr. signed a deed conveying to George Mason College 415 additional acres of land acquired by the Board of Control. This addition brought the school to its existing boundaries. In January of 1972 the UVa Board of Visitors recommended separation of George Mason College from the University of Virginia and the Virginia General Assembly and enacted legislation, H 210, which separated George Mason College from its parent institution, the University of Virginia, effective April 7, 1972. Governor A. Linwood Holton, Jr., signed the bill creating George Mason University on April 7. Thus April 7th is recognized at George Mason every year as "University Day." In the fall of 1972 the enrollment was 4,166. This period in George Mason's history is characterized by the expansion of the brand-new university's academic programs, physical plant, and infrastructure under Vergil H. Dykstra, who became president of the University in July of 1973. During this period 15 new undergraduate and 7 new graduate programs were created. Buildings critical to the growth of academics and student life at Mason, such as Student Union I and the Fenwick Library Tower (both in 1974), Robinson Hall (1975), and the first student housing on campus (1977) began to sprout up. After Dr. Dykstra left in April 1977, Dean Robert Krug became interim president. Enrollment jumped from 4,200 - 9,600. George Johnson became president in July 1978 and, under his tenure, George Mason University greatly increased its stature as a higher education institution in the state of Virginia. Enrollment climbed from 9,600 to 23,000. The University merged with the International School of Law in Arlington to form the the George Mason University School of Law in 1979. The Metro Campus began operation in 1981, and the the Robinson Professor Program in 1984. The School of Information Technology and Engineering - the first in the nation - was formed in 1985. George Mason economist James Buchanan won the Nobel Prize for Economics in 1986. The Krasnow Institute for Advanced Study was launched in 1991, and the Center for History and New Media in 1994. The George Johnson Learning Center, which combined classroom, technology, library, dining services, merchandising, and academic offices was completed in the spring of 1996. With "excellence" as its watchword with regard to programs and services, Mason has been gradually building a reputation nationally and internationally. Since 1996 the enrollment has jumped from 23,000 - to nearly 30,000. After the retirement of President George Johnson, Alan Merten of Cornell University became president in July 1996. Prince William Campus opened in 1997. George Mason formed a partnership with the American Type Culture Collection, housing it on the Prince William Campus in 1998. That same year it hosted the World Congress of Information Technology on the Fairfax Campus, and joined the the advanced computer networking consortium, Internet2. In 2001 Mason started the National Biodefense Center at the Prince William campus, and Mason Economics professor, Vernon L. Smith, won the Nobel Prize for Economics (the second Mason faculty member to do so) in 2002. The astonishing George Mason Men's Basketball team made a history making run to the 2006 NCAA Final Four, only losing in the tournament to the national champion, the University of Florida. Ras al Khaimah Campus in the United Arab Emirites, conceived in 2005 is the University's newest campus. With students from over 140 countries, Mason is of the most diverse institutions of higher learning in the in the United States.